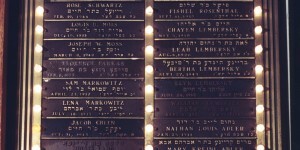 There are five yahrzeit plaques memorializing the deceased members of our community and their loved ones. Two of them were donated during time periods for which few records survive, but for three of them I have been able to find documentation of their origins. 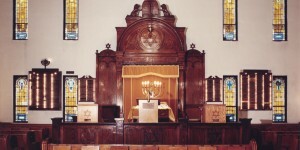 Note the yahrzeit plaques symmetrically arranged, alternating with the stained glass windows. THANK G-D FOR SYMMETRY. What happened next is unclear, but the December board meeting minutes mention the donation of not one, but two memorial tablets — the original one from Mrs. Sam Rosenthal and a second one from Mr. Sam Gordon. Problem solved! And better yet, the officers anticipated $1500 from the sale of all the available spaces! 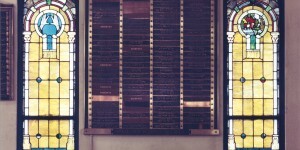 At that time both tablets had been received and were ready to be installed, but then there was some sort of hitch — in the March board meeting a “motion was made to see Mr Max Lazar in regards to the tablet, and obtain the parts which are in his possession, to complete the donors names on same.” A month later there was still no decision on when to dedicate the tablets, and perhaps things still continued to drag on, because during the July 1944 board meeting the “sec’y was requested to write a letter to Mrs Sam Rosenthal, assuring her that the Donor plate on the tablet will be attached as soon as the war will be over, during the war no brass is obtainable.” Soon, name plates began to be sold for $50 each. Two of the names on the Gordon yahrzeit tablet have Jewish stars next to them — the only names so marked on all of the tablets. The meeting minutes record why: In March 1945 the AZA made a contribution of $20 for a name plate in memory of Wilbert Newman, a charter member of the Homestead AZA, and in July, Fred Kaminsky, the advisor of the AZA, made another $20 for a name plate in memory of Milton Jackson. These boys were two of the six Jewish Homesteaders killed in action during WWII (all of their names are listed here). At a later date a plaque was purchased for the third of these boys, Jerome Solomon, but his plaque did not get a Jewish star marker. 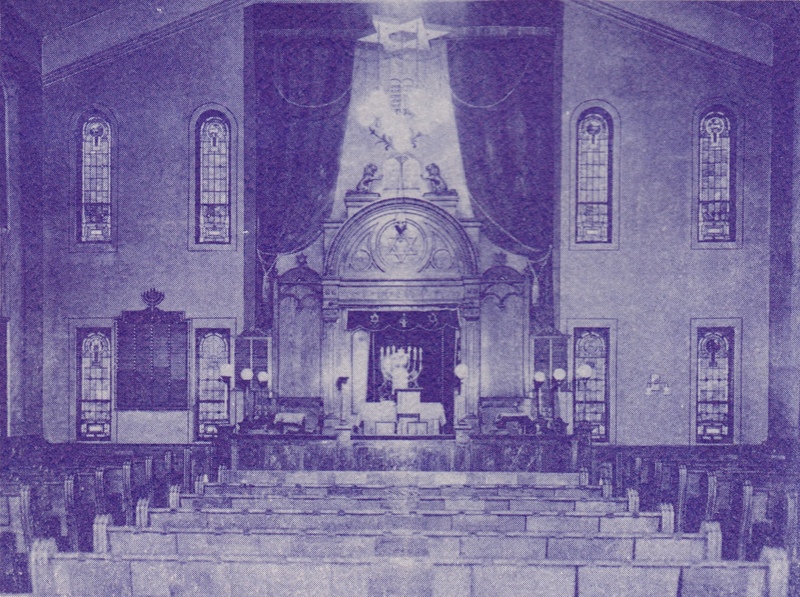 The third of the shul’s yahrzeit tablets came up for discussion at the November 1947 board meeting when Victor Averbach, on behalf of his father and other members of his family, expressed their wish to contribute one in memory of “their departed dear one Rachael Averbach.” Little was recorded about the ensuing conversations. This tablet is significantly bigger than the previous two, so they made no demands for a second one and installed just the one at the front of the synagogue. 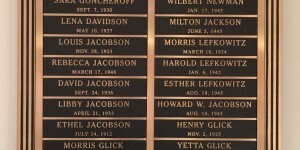 As of April 1949, the wires still hadn’t been connected to it, though in September of 1948 Victor Averbach resigned from the synagogue (not without confirming his family would still get the six plates on the memorial tablet they had presented). 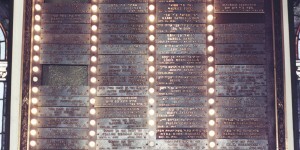 Every person on all of these plaques has a story. Many of the names are now familiar to me from the individuals and families I’ve been researching since August. Most familiar, of course, are those of my own relatives, all of which are on the fourth tablet, which my grandfather and his siblings gave in memory of their parents probably in the late 1950s. This tablet is the one which brought belated balance to the front of the shul. 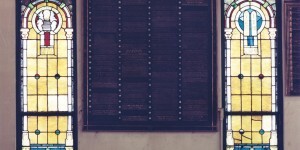 Given the later dates of all the people it contains, I suspect many of you have close connections to others on this tablet, too — likewise the last tablet, erected by the Zukerman family in January 1985, though no names appeared on it until at least 1993. The five tablets are nearly entirely filled; if any of us wishes to add more names, it won’t be long until someone will need to donate a new one. Their present setting in Beth Shalom is much more heimishe. 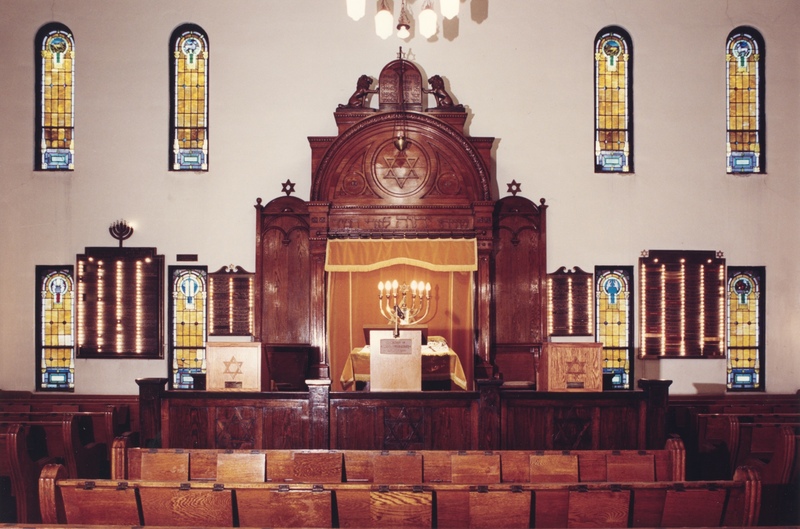 As many of you know, the original plaques were hung in the synagogue’s cozy Homestead Hebrew Chapel, which was created for them and the shul’s ark in ’93 or ’94, but all of these items and other Homestead Judaica were destroyed in the October 1996 fire. 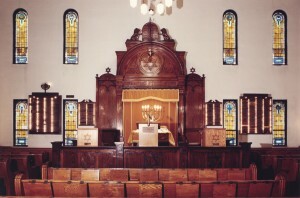 Replicas of the original tablets donated by Ed Balis hang on the walls of the rebuilt chapel, which is where Beth Shalom has minyan during the week. It’s this room where people saying kaddish begin to heal. 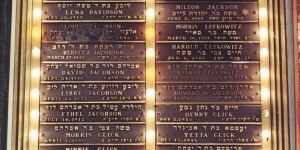 For that reason, a new Pittsburgh friend of mine confessed to me, she had her mother’s yahrzeit plaque added to one of the Homestead tablets, though she had no connection to our community. 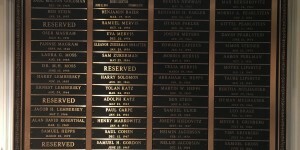 The first time I saw these plaques was in September after Shabbat morning services. The research I was doing at the time was focused on the early years when many of these men and women were at their prime, actively shaping the young congregation’s future. It felt to me as though I were skipping ahead to the end of the book, discovering with a shock that all of my favorite characters ended up dead. Such is life. 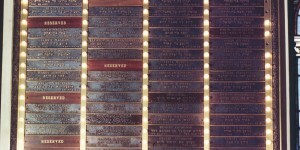 But through these plaques, they are not forgotten. This yahrzeit tablet was the shul’s first, dedicated by Mrs. Samuel Rosenthal in memory of her husband. The years range from 1895-1973. The re-made version of the Rosenthal yahrzeit tablet. This yahrzeit tablet was presented by the Jacobson and Gordon families around the same time as the Rosenthal one, since the shul demanded symmetry. The years range from 1912-1946. The remade version of the Jacobson-Gordon yahrzeit tablet. This large yahrzeit tablet, the third to be installed, was dedicated in memory of Rachel Averbach and her grandchildren Betty Ann Averbach and Milton Jackson, all of whom passed away in the 1940s. The years range from 1884-1979, with the bulk from the 40s and 50s. 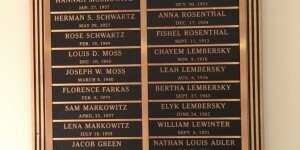 The re-made version of the Averbach yahrzeit tablet that now hangs in Beth Shalom. Large yahrzeit tablet dedicated by the children of Bernhardt and Berthe Hepps, my great-grandparents. The years range from 1904-1984, but the bulk are from the late 50s on. Likely this tablet was donated in the late 1950s after Berthe passed away making it the shul’s fourth. The re-made version of the Hepps yahrzeit tablet that now hangs in Beth Shalom. 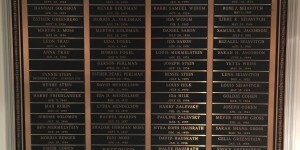 At the time the synagogue was closed, this yahrzeit tablet, dedicated in 1985 to the memory of Sam and Ida Zukerman by their children, was empty. When I viewed the re-made Zukerman yahrzeit tablet at Beth Shalom, it was nearly filled with yahrzeits from 1947 to 2010, with the bulk from the 1980s on. 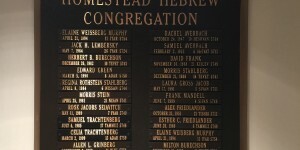 The picture shows the Averbach yahrzeit tablet on the left side of the front wall of the synagogue. 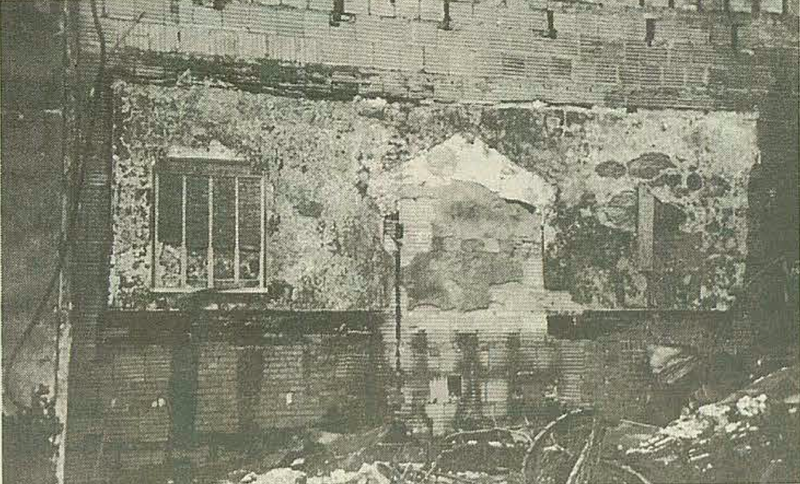 This picture shows the Hepps yahrzeit tablet on the right side of the front wall of the synagogue. Top: Rodef Shalom Homestead Hebrew Cong. Seiavitch Ida Chaya bat David April 1, 1930 3 Nisan 5690 In the old plaque she is at the bottom of the second column, and this position is blank. Stein Ben Tsvi Dov ben Chanina Baruch May 4, 1975 23 Iyar 5735 The new plaque says 1976, but the old plaque has 1975 as does his gravestone. 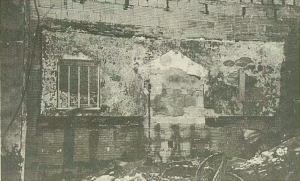 Lipshitz Motke Motke ben Yechezkel January 18, 1943 12 Shevat 5703 Shoah victim? Lipshitz Taube Toiva Leah bat Yisrael January 18, 1943 12 Shevat 5703 Shoah victim? Gosh, there are a lot of names there that I haven’t thought of for a long time. Notice that there are many Seiavitch’s. My dad always bought our cars from Bob Savage Desoto-Plymouth. When I was a kid, I would wonder why his name was Savage, which didn’t sound very Jewish to me. He is on the Zuckerman tablet. Not that we Heppses should talk! It’s nice to know that you remember some of these people!